Death In June: An interview with Douglas P.
Death In June was formed in 1981 by Douglas Pearce, Patrick Leagas and Tony Wakeford. 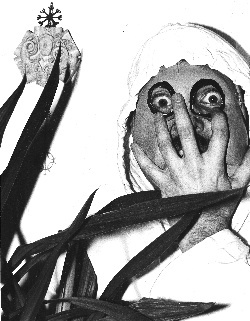 Since 1985 Death In June has consisted of one sole member, Douglas Pearce, aided by others if and when required. It is with this present incarnation of Death In June that this interview is concerned (for a complete dissection of Death In June and their numerous releases read the excellent and informative articles on Death In June in Fractured #1 & #3). Since the last split in personnel Death In June have released four stunning albums: "The World That Summer", "Brown Book", "The Wall Of Sacrifice" (limited to 600 vinyl copies) and the recently released "But, What Ends When The Symbols Shatter?," alongside various compilations: "1888" and "93 Dead Sunwheels" plus some unofficial releases, too: "Night and Fog" & "Flowers Of Autumn". As well as recording with fellow travellers Current 93, Douglas P. was also involved in the writing and recording of the classic, "Music, Martinis and Misanthropy," with Boyd Rice and Friends during 1990. Throughout their 11 years of creative output Death In June have succeeded in maintaining a low profile, and coupled with the fact that Douglas P. believes the music speaks for itself, explanatory notes are not given and self articulation is not necessary. With dreamily intense albums wrapped in runic and age old symbols, Death In June continue to mystify and exhilirate the listener with their ambiguity. compulsion: Since 1983 you've worked closely with David Tibet of Current 93. How did this collaboration come about? Do you think this collaboration has influenced the sound and thoughts of Death in June? D.P. In the summer / autumn of 1983 I noticed David Tibet and other members of Psychic TV / T.O.P.Y. coming along to some of Death in June's concerts in London. I was already aware of him and his work with Psychic TV and 23 Skidoo so I was intrigued in why he / they were taking an interest in us. Eventually we got around to talking at this club called The Living Room where Death in June were playing and realised we both got on very well. I said I was interested in working with other people and he said he had some lyrics he would like music added to, so things went from there. I think "influenced" is the wrong choice of word. I feel "inspiration" would be more appropriate. 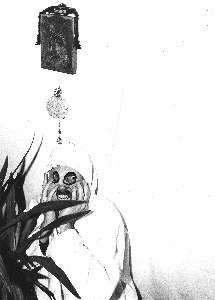 Tibet's words and personality have certainly acted as an inspiration to the work of Death in June. In turn, I think I've certainly influenced the sound of Current 93. To influence and to inspire are completely different concepts. compulsion: You recorded an album with Boyd Rice ... how did this come about? What was Boyd like as he's portrayed as being quite an extreme sort of character? D.P. Boyd Rice and myself have been in contact with each other since about 1986 during the making of Current 93's "Swastikas For Noddy". This was either on the telephone or by post. Once again, we were already aware of each other and I particularly loved his work with Current 93. So, anyhow, he sent me some material which eventually turned up on "The Wall of Sacrifice" LP. However it wasn't until June 1989 that I flew out to Tokyo to join Current 93 in a tour out there that I finally met him and, of course Michael Moynihan (of Blood Axis). Boyd wanted me to do some drumming with NON, so it was during those rehearsals that we started experimenting with ideas that later turned up on "Music, Martinis and Misanthropy". There was an instant rapport. That LP turned out to be a masterpiece. What is Boyd Rice like? There have been a couple of articles in the U.S. press recently. In one he is described as "Bambi meets Satan's Cheer Leader" and in another the question is asked "Nazi or Mouseketeer". Probably both, I should think!! In fact, he seems a perfect candidate for a managerial post at Disneyland. compulsion: On numerous Death in June albums, numerous people have contributed to various tracks. You're quoted as saying "It's best to deal with other leaders. There is no room for passengers," why? D.P. Quite simply it's better to deal with people who don't want anything else out of you other than your own "talents" whatever that word might mean. They have a very clear vision as regards what they are about. That is good. They are strong individuals. And, that's also very good. They do it for Love. And that is Everything. compulsion: One of the main features of Death in June over the years has been their low exposure (in the UK at least). What are the reasons for this continued low coverage, selective infrequent performance? D.P. I think there are 2 separate issues here. From the very beginning Death in June never intended to become another touring group. We all knew that would defile the idea if we started putting ourselves in the hands of promoters and the like. Selective performances were always going to be the order of the day. However, after Patrick Leagas left in May 1985 I had to make some serious decisions regarding the future of the group whose very sense of being then, was stronger than it had ever been. Studio work was much more important to the survival of Death in June than any amount of concerts. On top of all that there were the obvious logistical problems of performing again. Since Patrick left I have been the only official member of the group. As I choose to work only with other leaders, trying to get everyone together at the same time is a real problem. When Death in June, Current 93, Sol Invictus and NON have come together to perform in Japan and more recently in Austria, Germany and in London they were real one-offs! The permutations of everyone's separate lives are too complex to coincide very often. As regards the low exposure in this country then it's probably a combination of my disinterest in the "hack" press here and their disinterest in me! 10 years on they are hardly relevant to Death in June's existence. They die off. I don't!!! Yet. compulsion: The studio LP "The Wall of Sacrifice" sounded more atmospheric, more along the lines of a film soundtrack. Was there any reason for doing an album with this approach? If given the opportunity would you consider doing a film soundtrack? D.P. Whenever, I've recorded an album it's never been preplanned and you don't know what it's going to sound like until it's finished. You naturally have an idea about some things but very soon the whole thing starts to take on a life-force of it's own. "The Wall of Sacrifice" naturally progressed that way and, in fact, the order in which they were written / recorded is the order in which they appear on the record. I think the same applies to "Brown Book". The approach dictates itself. Time dictates that. Everything comes out exactly how it should sound. Certainly on "The Wall of Sacrifice". Regarding writing for films then I have already done that some years ago. Like a lot of these "art" movies it has yet to see the light of day. If ever Death In June put out a video, clips from that will probably be included. Who knows? There's loads of other stuff as well but trying to get one's hands on it without parting with a fortune is another matter. "Drunk with the nectar of submission, I feel nothing more than existence." "Order must be restored, decay is the only inviting alternative." compulsion: This summed up the feelings of Death In June in 1988. "The Wall of Sacrifice" was also regarded as possibly being the last LP. What were the reasons for this? D.P. Exhaustion with the situation? Total resignation?? 32 years worth of living??? There are many reasons why but, they probably revolve around the same, fundamental problem. That is mystical. That is spiritual. That is for me alone to live with. compulsion: Is the album "The Cathedral of Tears" in a similar vein to "The Wall of Sacrifice". Who contributed to this recording? D.P. "The Cathedral of Tears" is not the new album. It is a CD only release that features the tracks off of "The World That Summer" and "Brown Book" so far unissued on the CD format. It also has a remix and the title song is new. It is the counterpart to "The Corn Years" CD. It is the end of an era. It is a rounding up. The true new album is called "But, What Ends When The Symbols Shatter?". I hope it will be ready by late Autumn / early Winter. But who knows? There has to be a reason. I'm not sure if I've got one anymore. "The Wall of Sacrifice" could still turn out to be the last. compulsion: Death In June sleeves are always stunning and well packaged, however recent copies of "The World That Summer" no longer have the embossed cover. Was expense the simple reason for this or what? D.P. Absolutely not!! Expense has never stood in Death In June's way regarding sleeve presentation. The plain fact of the matter was that the factory in France which used to print the sleeves closed down. This also affected the "Burial" sleeve cover. Just before Xmas `90 I went over to France to see if I could get the agents there to find someone else willing to do such odd embossed effects. However no such luck, unfortunately. The embossed Roses are probably gone forever!! compulsion: What were the reasons for the NER/Japanese Supernatural Organisation's release of Death In June "Live in Japan" being both difficult to obtain and being so expensive? D.P. Basically, in a word, it was a bootleg! I never received a penny for that release and despite providing the photos for the sleeve I was never consulted about anything else regardless of a contract being signed and tapes being listened to. The tapes I heard are not those that turned up on the record. Also the Japanese characters that are on the front of the sleeve do not spell Death In June but, something like June's Death. Pathetic rip-off merchants!! That whole period is a very complicated story. It's too sad to buy. For once I was very stupid and trusted people. I was very sick at the time. compulsion: Are there any plans to release a recording of the Boyd Rice (NON) performance from Japan in December 1988? D.P. I don't really have any say in that matter although, as far as I'm aware, Mute Records intend to put out a compilation of the best of NON and several tracks from the Japanese concerts will be included. "Easy Listening For Iron Youth" is something well worth looking out for!! compulsion: How did the inclusion of Death In June on "The Sacred War" compilation come about? D.P. This German / American company approached me about the Autumn of 1989 and said they planned to release a CD featuring amongst others NON, Anton LaVey, Sol Invictus and Charles Manson. The project was originally called "The Demonic Revolution" and I very much liked that title. So, I sent them tapes of the remixes off of "The Wall of Sacrifice" and then heard nothing for about a year. In that time I had given up on that project so I decided to issue those tracks on "1888". However, it suddenly did appear as "Sacred War" with a revised list of names included. compulsion: Death In June played live in Britain in May 1990, the first appearance in Britain for several years. What was the line-up and how successful was the performance? D.P. The line-up for that particular show, and the ones that preceded it in Austria and Germany was David Tibet, James Mannox, who has also performed a great deal with Current 93 recently and naturally myself. Who knows what "successful" means??? This is an update and expansion on the original interview. This section dates from July 1992.
compulsion: Since 1985 you have been the sole member of Death In June. Since this period Tony Wakeford, Patrick Leagas and yourself all seem to be veering in similar directions albeit individually. Do you think the departures within the group acted as a catalyst to the formulation and pursuance of your own vision and ideals that underlie the work of Death In June? D.P. First of all I'm not quite sure if it is true that all 3 of us are heading in the same direction. I have almost no contact with Patrick and therefore am very unfamiliar with his work. Obviously the departures of both Tony and Patrick acted as catalysts because that's exactly what I wanted. Their time as protagonists in the group had come to a natural end and their respective departures would inevitably lead me to new pastures. compulsion: I read that the Crisis recordings are to be reissued on the CD format, if so could you provide some details on when this is due to be released and on what label. In retrospect how do you feel about the work you did with Crisis? D.P. I think that CD compilation will be out in September. I have no real feelings about the group. "It is an honest representation of dreams and ideas in full action. Pure and in some respects simple. Youthful dreams then - now those dreams are helping to create the mythology of which this is just a small fragment". How do you regard the early work of Death in June in relation to the more subtle and spiritual nature of Death in June today? D.P. To quote what is a German bootleg LP is not really the best of sources. I actually feel some of the early work still stands alongside todays work. Heaven Street , State Laughter, The Guilty Have No Pride are all very good tracks. Till The Living Flesh Is Burned has a very spiritual nature to it. The articulation may have changed but, the spirit has not departed. compulsion: You seem to be spending increasing amounts of time in the USA collaborating with Boyd Rice and Anton LaVey. Like yourself, both Boyd Rice and Anton LaVey are strong individuals with a clear vision. You mentioned last time a feeling of "total resignation", have both men acted as an inspiration to you to continue your work? D.P. According to some magazines I am spending more time in the States. In fact, I haven't been back there since March 1990, when I finished recording the Boyd Rice And Friends album. A lot of the work on the proposed new projects with Anton LaVey and NON can be done via the phone or post. I hope that NER will be releasing an album featuring the varied work of the head of The Church of Satan. At the moment we're still waiting for the artwork. The same really applies to the Ragnarok Rune album that NON will put out. I hope they will be ready by the Autumn. On top of those projects we do plan to do a Boyd Rice And Friends II which will certainly mean me / Boyd doing some flying. Until then, which will hopefully be this Winter, I have yet to actually meet Anton. Working with Boyd on the "Music, Martinis and Misanthropy" album was obviously inspirational. Hopefully, for both of us. I really felt the need for some mental fresh air and Boyd, Michael Moynihan and Denver provided it. I really love that album. It was the oasis I was at between "The Wall of Sacrifice" and "But, What Ends When The Symbols Shatter?." compulsion: Today the music and lyrics of Death In June have a dreamlike quality, drawing upon dreams and symbolism. I would assume this to be of a personal nature to you, however, would I be right in assuming your interest in magic and runes although not instigated by Tibet, it was one of the ways in which he inspired you. How important are these to you today? D.P. As I have said in previous interviews, I have always had an interest in those things but, hadn't really done anything serious about it until Tibet came along. He acted as a catalyst in the magical area. However, it was probably me that got him interested in the runes themselves. I would think the years' 1983-87 were particularly special ones for us. But, those days are gone. However, they are never not there. compulsion: Death In June increasingly stress the importance of the "natural order" and throughout your work there is reference to death and decay, and in turn life and love. For me it is through this contempt of the modern world that the significance and meaning of Death In June is manifest. How would you respond to this view? D.P. That is probably some of the story. compulsion: "But, What Ends When The Symbols Shatter?" When is this due for release and who contributed to the recording? D.P. "...Symbols Shatter?" came out on the 29th of June, 1992. Naturally Tibet is there and also James Mannox and Simon Norris who I've been working with live in France and Italy. There is also Michael Cashmore who I met and have worked with in Current 93. 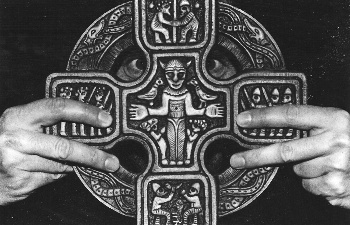 Current 93: the great clearing house for Industrial folk!! Anyway, he told me he had had a dream in which he heard me playing this song on the radio. When he awoke he couldn't remember the words but could remember the music so he did a tape of it, sent it to me and it went from there. compulsion: You plan to release a NON video, is this of the live performances you aided Boyd Rice with in Japan? D.P. I hope to be releasing the NON live in Osaka video via the NER mail-order service. compulsion: To me, Death In June are shrouded in ambiguity, as you choose not to articulate your work, and leave it open to people's interpretations. But, in turn, this often leads to a misrepresentation. What do you think is the biggest misconception people have of Death In June? D.P. I'm not at all concerned with misconceptions when I know the actuality. compulsion: Finally you stated "there has to be a reason, I'm not sure if I've got one anymore". Aren't the releases of albums such as "Night and Fog" and "Flowers of Autumn" an indication of the high regard and importance that people place upon your work, or do you feel you need a more personal reason to continue with Death In June? D.P. Obviously, because Death in June is just me I have to have a personal reason for its continuation. Survival, work and faith are all good friends of mine. I had to wait for the right moment and that right moment was at the beginning of this year. I'm very pleased with the outcome. Other people's opinions about my work have never really made much of an impression on me so, when you say it is held in high regard it doesn't really mean anything. I only listen to my heart and those very close to me. compulsion: Anything else you would like to add? D.P. What with "But, What Ends When the Symbols Shatter?" only just being issued everything is being geared to that for the moment. I also hope to release the 2 tracks I co-wrote with Tibet as a 6 track single. There will be English, French and instrumental versions of them. Maybe that will be out in August. There will also be a special single issued of The Cathedral of Tears. This is a studio recording of the song featuring basically an acoustic guitar and a church organ. There are also plans to release a CD by Somewhere In Europe and also Ian Read's new group Fire and Ice. Ian used to be in Sol Invictus and Current 93. Perhaps in October we will go to Eastern Europe to play some concerts. www.brainwashed.com/dij Brainwashed site devoted to Death In June. www.deathinjune.net Death In June's official site detailing current releases and miscellaneous mail order items. www.tesco-germany.com or www.tesco-distro.com Tesco Distribution, distributor of Death In June releases.